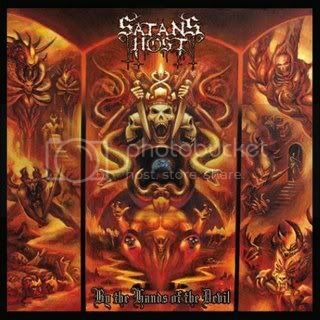 Denver’s SATAN'S HOST are part of a frustrating breed of band, a breed that have been around forever (first album = 1986 in this case), have at least one semi-famous dude in the mix (here, it’s Harry “Tyrant” Conklin of JAG PANZER fame), play a weirdly satisfying blend of trad metal, black, and death (check), and toil away in obscurity despite releasing material on a shockingly regular basis (again, check). Hmm, well, okay, there is no breed of band that this describes: there’s just Satan’s Host. They’re really in a league of their own, which is the result of a bunch of ol’ dogs just putting their heads down and playing metal the way they love it. The main difference about Satan’s Host’s new one, By The Hands Of The Devil, and their last, ‘09’s insanely named Power ~ Purity ~ Perfection ... 999, is that something old is new again, namely the return of Tyrant, who is back on vocal duties after a 20-year hiatus from the band. The meeting of the voice and the band sounds great, especially on tunes like ‘Fallen Angel’, which is so melodic and has such a classic feel to it that I suggest to Lopez that it kind of sounds like a glam power ballad about Satan, a unique proposition indeed, and one that is symbolic of the band’s interesting sound in general. But does the band ever worry that this meeting of vibes, eras, and sounds might alienate some listeners? And while fans’ eyes are on the new album, the band is looking ahead. And this time around, the looking ahead involves a little looking back, as Lopez explains.